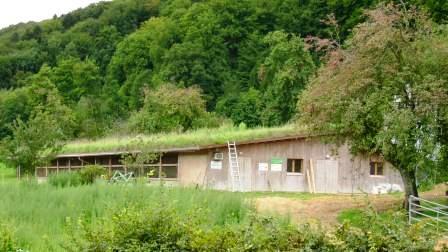 Our Greenroof Project of the Week (GPW) is the rustic extensive 1,000 m ² “Asphof Hen Unit” greenroof in the beautiful countryside of Rothenfluh, Switzerland. A conglomeration of seven medieval villages, Rothenfluh is a picturesque municipality in the district of Sissach in the canton of Basel-Country in northern Switzerland. Aramis and I had the pleasure of visiting the lovely area in September, 2005 where I presented my paper “An International Call for The Greenroof Projects Database” at the first The World Green Roof Congress held at the University of Basel, Switzerland. 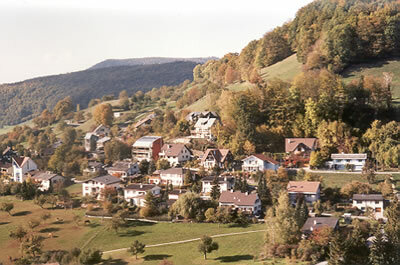 The Congress was co-organized by ZHAW – Zurich University of Applied Sciences Institute of Environment and Nature Resources, Centre Urban Greening, Competence Centre Green Roofs (Hochschule WÃ¤denswil) – and the International Green Roof Association (IGRA), among others, and the tours were led by graduate students and volunteers from ZHAW/The World Green Roof Congress. We jumped at the opportunity to join one of the local tours that encompassed “Green Roof Week” from September 12 -17. Congress attendees had a choice of a wide-ranging excursion program ranging from one to three-day trips, “showing examples of good practice on famous green roofs in Switzerland and the surrounding area of Basel.” We opted for a one-day tour and wonderful host and guide was Nathalie Baumann, MSc / Biogeograph, ZHAW Research Associate, who specializes in the ground-breeding Lapwing bird population nesting atop various brown and greenroofs in the area. We visited six very different applications, from one of Nathalie’s research sites atop a huge pharmaceutical manufacturer to the largest solar roof installation with greenroofs in Switzerland, to a greenroofed cattle barn and this organic chicken farm with two greenroofed structures, where we enjoyed a fantastic Swiss lunch, too. The owner, Matthias Eglin, really wanted to tread lightly upon the land in terms of blending the large chicken barn/coop into the landscape and providing a literally cooler environment for his 2,000 organically-raised chickens. He turned to renown biodiversity researcher Dr. Stephan Brenneisen of Hochschule WÃ¤denswil (also the coordinator of the World Green Roof Congress and president of the Green Roof Competence Centre), who served as project consultant for the Canton Basle Rural’s Nature and Countryside Protection Commission – see the federal service project on ZHAW’s website. Their intent was to establish an extremely low maintenance xeric landscape on top of an agricultural utility building and have it eventually naturalize to mimic the surrounding terrain. The natural temperature control reduces the heat by up to seven degrees in the summer (relative to outside temperatures), due to cooling effects of evaporation, resulting in more stress-free chickens! When we were there it was fun to watch them roam freely about the property, hopping from one roof to the next. 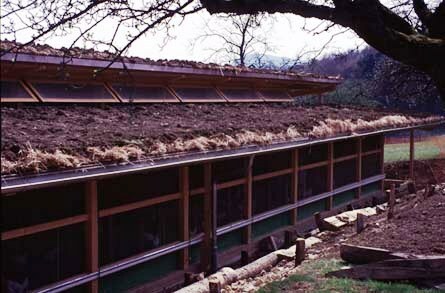 The second 1,200 sf greenroof is found on the Hay Shed Greenroof, constructed in 2005, which shelters hay rolls used on the farm property. Christine Thuring served as a Congress team member and guide on one of the other tours during the Congress. Co-founder of Green Roof Safari (and Chlorophyllocity and, of course, one of our contributing editors), along with Jörg Breuning (of Green Roof Service, LLC) she has lead tours here since, as well. Green Roof Safari offers special access to the European greenroof industry with custom designed tours with multi-lingual guides specializing in highlighting current and historical trends in policy, research and design for the areas visited. So successful that they don’t even mow it – the roof meadow acts as a self-sustaining system, fully integrated into the landscape. If you’re interested in seeing this project, you’re in luck. Now in its sixth year Livingroofs.org Ltd will be again partnering with Hochschule WÃ¤denswil for their famous “Swiss Green Roof Tour 2010” which will be held on May 6-7, 2010. You’ll not only get Dr. Stephan Brenneisen, but also the indomitable Dusty Gedge, Director of Livingroofs.org, both of whom are internationally recognized for their work on greenroofs and biodiversity. Much of the focus of the tour is how research in Switzerland has developed an approach to green roofing that has biodiversity at the heart of their design. From roofs designed for lizards, to those that have been designed for rare bees, beetles and spiders, this year the tour includes visits to roofs where Swiss researchers are studying ground nesting birds – and to where chickens are happy, too, on the ground and on the roofs.